An all-new 3.6L V-6 engine debuts in the 2016 Cadillac CT6, setting benchmarks for efficiency, refinement and durability in the brand’s range-topping large luxury performance sedan. 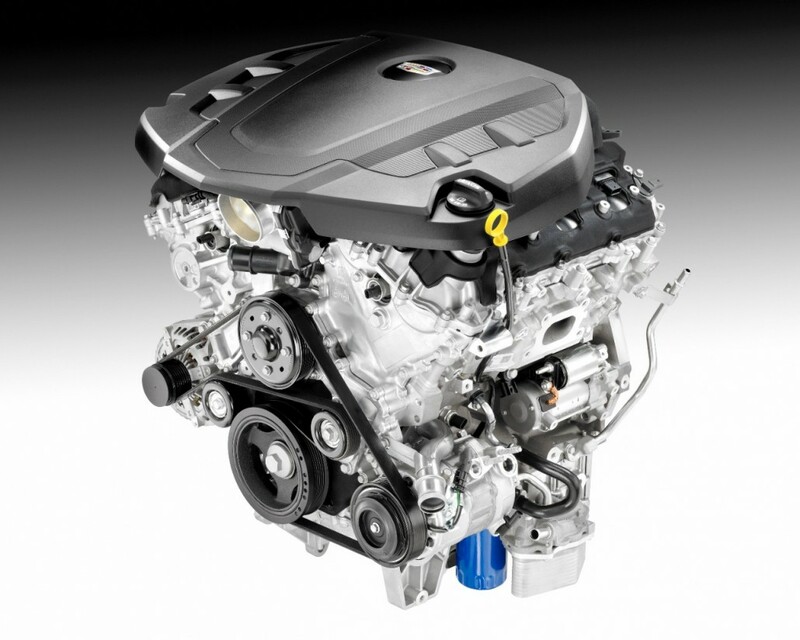 The clean-sheet engine design is the fourth generation of GM’s acclaimed DOHC V-6 engine family and incorporates new features, including Active Fuel Management (cylinder deactivation) and stop/start technology to enhance fuel economy up to a General Motors’-estimated 9 percent when compared to the previous engine. Noise-reducing features, including an all-new cam drive system, contribute to the new 3.6L being up to 4 dB quieter at idle and under low load driving conditions than the benchmark Infiniti 3.7L V-6. GM’s Active Fuel Management system temporarily deactivates two of the 3.6L’s cylinders in light-load driving conditions to enhance fuel efficiency and seamlessly reactivates them when the driver demands full power. With an efficiency-enhancing stop/start system, the engine is shut down in certain driving conditions such as stop-and-go city driving to reduce fuel consumption, automatically restarting when the driver takes his or her foot off the brake pedal. An all-new Hydra-Matic 8L45 paddle-shift eight-speed automatic transmission is paired with the new 3.6L V-6 in the CT6, elevating the CT6’s driving experience with one of the luxury market’s smoothest, quietest and most efficient powertrain combinations. In addition to the CT6, the 2016 Cadillac ATS and CTS will offer the all-new 3.6L, where they are expected to lead their respective segments in fuel economy and non-boosted V-6 power. Also, a new 3.0L twin-turbocharged engine based on the same architecture will be offered on the CT6. Structurally, the all-new 3.6L V-6 is similar to the proven, award-winning design of the previous V-6 engines, including an aluminum, deep-skirt cylinder block. The optimal 60-degree cylinder angle is retained, with the bore size enlarged from 94mm to 95mm and the bore centers stretched from 103mm to 106mm. The cylinder block features six-bolt main bearing caps and inter-bay breather vents that enhance power and oil flow management. A larger crankshaft bore diameter and wider bearing cap bulkheads in the block provide higher main bearing load-carrying capability. The block also accommodates larger, 12mm cylinder head bolts to provide greater clamping strength for the engine’s higher output. The crankshaft is forged from 1538MV steel and inherently stiffer than a conventional cast-iron crankshaft, contributing significantly to the engine’s smoothness, quietness and durability. Attached to the crankshaft are high-strength connecting rods and pistons. The rods are sinter-forged and composed of a high-copper alloy that stands up to high heat and resists bending, while the polymer-coated hypereutectic pistons are designed to minimize friction, allowing for a tighter piston-to-bore clearance that results in quieter operation. The new 3.6L V-6 also incorporates oil-spray piston cooling, which helps reduce noise, lower combustion temperatures and enhance durability by drenching the underside of each piston and the surrounding cylinder wall in an extra layer of cooling, friction-reducing engine oil. Camshaft phasing allows the greatest variances in valve timing to make the most of power and efficiency. The new 3.6L V-6 engine takes that technology to the next level with intermediate park technology for the intake camshaft phasers. Because optimal part-load efficiency requires retarding the intake cams to reduce pumping losses, the effect also reduces the effective compression ratio, which affects the engine’s cold-start performance. Conventional cam phasing system authority is limited by how far the intake cams can be retarded in the parked position without affecting cold starting. Intermediate park technology, which incorporates an intermediate-lock intake variable valve timing cam phaser, allows the cams to be parked at the most favorable position for cold starting, while expanding the amount of intake cam retard for other conditions by adding another 20 degrees of intake phaser authority. This enhances fuel efficiency and reduces emissions. Unlike conventional systems, which force coolant flow from the front of the block to the back, the new 3.6L’s patented targeted cooling system sends coolant simultaneously to each water jacket in the heads and block. This new, parallel-flow design maximizes heat extraction in the area of the upper deck, intake and exhaust valve bridges in the heads and integrated exhaust manifold with a minimal amount of coolant. The result is more even and consistent cooling, which enhances performance, and faster engine warmup, which improves cold-start efficiency and reduces emissions. Additionally, the strategic sizing of the coolant jackets in the head and the block reduces the cooling system thermal inertia, allowing the use of a smaller water pump, which requires about 50 percent less power to drive, enhancing fuel efficiency and even allowing a lower overall height of the cylinder block. An all-new cylinder head design builds on the airflow attributes of the current V-6, supporting a broader power band that ensures excellent low-rpm torque, for strong power at take-off, and excellent airflow at high-rpm, for greater horsepower. Engineers achieved that through increased in-cylinder mixture motion, a faster burn rate of the air-fuel mixture and attributes that took full advantage of the new intermediate park cam phasing system. The new head design also has improved combustion chamber cooling enabled by the patented targeted cooling system, which reduces the chance for knock and enhance high-load efficiency. An integrated exhaust manifold rounds out the head’s features, saving weight over a conventional, separate head/manifold assembly. The all-new 3.6L V-6 continues to employ direct fuel injection to make the most of efficiency and performance. Along with the placement of the fuel injector in the combustion chamber, the piston top is carefully shaped to promote a through mix of the air and fuel, and direct the fuel spray to ensure a more complete combustion. A higher-capacity engine-driven fuel pump supports the higher output of the new engine and contributes better fuel atomization, which enhances performance, and reduced emissions. Active Fuel Management, also known as cylinder deactivation, imperceptibly shuts down the No. 2 and No. 5 cylinders in certain light-load driving conditions to save fuel. Two-piece structural oil pan – For stiffness and strength, the oil pan features an aluminum structural upper section. A stamped steel lower section provides optimal noise-absorption characteristics, for quieter performance. Camshaft drive – It is all-new, with a simpler design – two chains and six sprockets vs. the previous three chains and nine sprockets – with lower chain loads, which enhances durability. The lower tension of the chain drive, along with cushioned ring sprockets, also reduces noise and vibration. High-flow intake manifold and acoustic cover – The lightweight composite intake manifold offers greater airflow capability than the current 3.6L engine, which matches with the higher-flow heads to support the new engine’s greater output. A one piece engine cover mounts atop the manifold for exceptional noise isolation.